Having spent the better part of this year sketching with pencil, I have some observations about the different techniques needed for pen and ink sketching. With pencil, one can approximate an outline with spurious strokes. They can be blended. I found myself approximating my pen stroke in the air above the paper before committing the indelible line to paper. The lines in the figure were successful. Most of the feathers of the gentleman’s hat were gray but there was one that had a splash of red color. 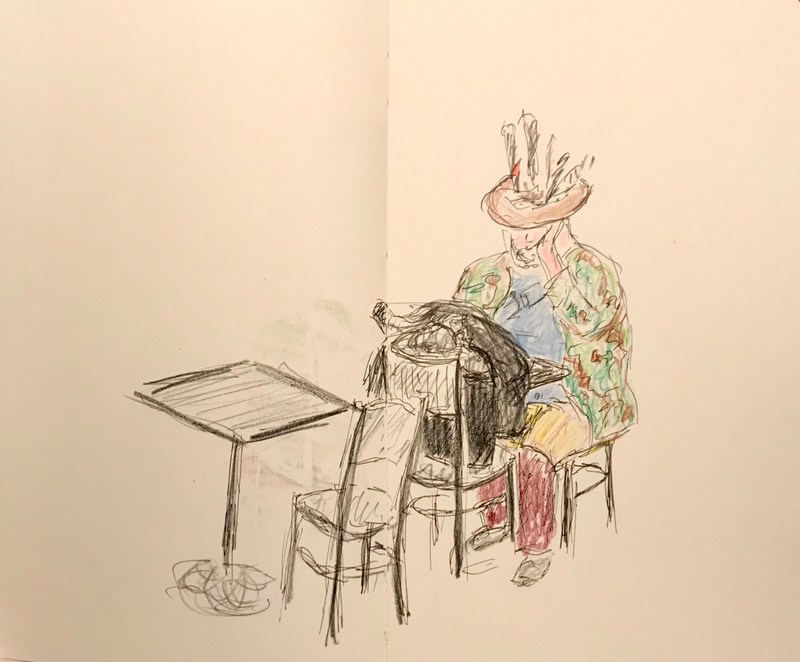 In the sketch below, the man’s jacket and shirt are most notable; in real life, the hat attracted the most attention. This entry was posted in Personal Stories and tagged art, artistic process, artistic technique, colored pencils, creativity, drawing, pen and ink, portrait, sketch, visual art. Bookmark the permalink.